Hardening, oil-toughened, muffled furnaces: gas. Architectural glass; machinery glassware; mirrors. BAIRD & TATLOCK (LONDON) LTD. Head Office: FRESHWATER ROAD, CHADWELL HEATH, ESSEX. T.A., "Burette, Romford". T.N., SEVen Kings 6081 (15 lines). Works: HIGHAM LODGE, BLACKHORSE LANE, WALTHAMSTOW, LONDON. T.N., LARkswood 2603 and 4628. London Office: 14/17 SAINT CROSS STREET, HATTON GARDEN, LONDON, E.C.1. T.N., HOLborn 2613. Established 1881. Laboratory glassware; lamp-blown scientific, laboratory and medical glassware and apparatus; sintered glassware. Directors: J. E. C. Bailey, C.B.E. (Chairman and Managing); C. B. Chartres, C.B.E. ; J. M. C. Fox, B.A., A.R.I.C. ; H. H. Baird; C. L. Prior; G. E. Howard. Secretary: P. J. J. Mahoney. BAKER (C.) (OF HOLBORN) LTD. Head Office: 244 HIGH HOLBORN, LONDON, W.C.1. T.A., "Optivorum, Westcent, London". T.N., HOLborn 1427 and 4004. Works: METRON WORKS, PURLEY WAY, CROYDON. T.N., CROydon 6644. Established 1765. Microscopes for research, medical, educational and industrial purposes; epidiascopes, photomicrographic and projection apparatus; optical equipment; lenses, prisms and mirrors; phase contrast microscopy. Managing Director: C. Lees Curties. BALDWIN (ROBERT L.) & LUCAS (ARTHUR), 93 WHITTON AVENUE, GREENFORD, MIDDLESEX. T. N., WEMbley 3353. Established 1945. BALLBROOK SURGICAL INSTRUMENT CO. LTD., 9 BLACKFRIARS STREET, SALFORD 3. T.A., "Balcosurg, Salford" . T.N., BLAckfriars 1403/4. Established 1945. Glass syringe blanks, pistons and barrels; hypodermic and serum syringes. Managing Director: E. L. Silverstone. BARRETT (FREDERICK), 2 SILVER STREET, ENFIELD, MIDDLESEX. T.A., "Enfield 1963" . T.N., ENField 1963. Established 1918. BARROWCLOUGH & SANDERS, STAINED GLASS STUDIOS, 23/25 NORTH ROAD, PRESTON, LANCS. T.N., Preston 5417. Stained glass windows; leaded lights. 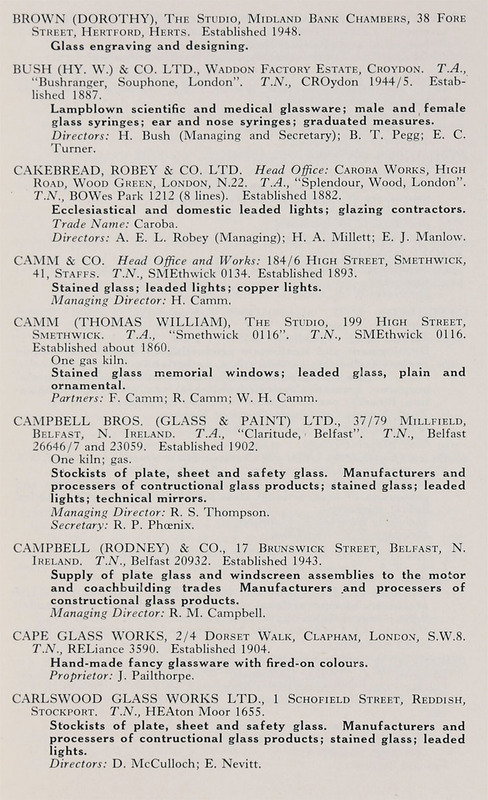 Proprietors: T. Beech & Sons (Glassworks) Ltd.
BAXENDALE & CO. LTD., 10/20 THOMAS STREET, MANCHESTER 4. T.A., "Baxendales, Manchester". T.N., BLAckfriars 8282. London Office: 223 GRAND BUILDINGS, TRAFALGAR SQUARE, W.C.2. T.N., WHitehall 5782. Established 1863. Stockists of plate, sheet and safety glass. Manufacturers and processers of constructional glass products; stained glass; leaded lights; wall panelling. BEAUMONT & PARKINSON LTD., ELIZABETH STREET, BLACKPOOL, LANCS. T.A., "Beaupark, Blackpool". T.N., Blackpool 20106/8 (3 lines). Established 1898. One decorating kiln: electricity. Stockists of plate, sheet and safety glass. Manufacturers and processers of constructional glass products; specialists in bent glass articles; stained glass; leaded lights; patent glazing. BECK (R. & J.) LTD. Head Office: 69 MORTIMER STREET, LONDON, W.1. T.A., "Objective, Wesdo, London ". T.N., MUSeum 9696. Works: LISTER WORKS, DICKENSON STREET, KENTISH TOWN, LONDON, N.W.5; BUSHEY MILL LANE, WATFORD. Established 1847. Optical instruments; microscopes; photographic lenses; spectroscopes; sound recording and reproducing optical systems; optical units, lenses, prisms, etc. Trade Names: London; Binomax; Luminex, etc. Joint Managing Directors: C. J. Beck; S .Borthwick. BEECH (T.) & SONS (GLASSWORKS) LTD., 23/25 NORTH ROAD, PRESTON, LANCS. T.N ., Preston 3246/7. Established about 1900; Incorporated 1938. Stockists of plate, sheet and safety glass. Manufacturers and manipulators of constructional glass products; stained glass windows; ophthalmic lenses; light filters; magnifiers. Managing Director: E. A. Beech, M.Sc.(Econ.). BELL BROTHERS (DOMESTIC) LTD., WESTFORD, WELLINGTON, SOMERSET. T.A., "Belbro, Wellington, Somerset". T.N., Wellington 377/8. London Office: 24 COLEMAN STREET, E.C.2. T.A., "Summation, Ave, London". T.N., MONarch 3661. Established 1934. Laboratory glassware; lamp blown scientific and medical glassware and apparatus; machinery glassware. Directors: O. C. Kerrison (Managing); T. H. Phillips, O.B.E. ; H. Evans, A.C.A. ; R. J. O'Donovan. BELLINGHAM & STANLEY LTD. Head Office and Works: 71 HORNSEY RISE, LONDON, N .19. T.A., "Polyfract, Norphone, London". T.N., ARChway 2270. Works: 71A ST. JOHN'S ROAD, TUNBRIDGE WELLS, KENT. T.N., Tunbridge Wells 20207. Established 1914. Directors: F. Stanley (Joint Managing and Secretary); L. Bellingham (Joint Managing). BENJAMIN ELECTRIC LTD., BRANTWOOD ROAD, TOTTENHAM, LONDON, N.17. T.A., "Benjalect, Southtot, London". T.N., TOTtenham 5252/6 (5 lines). Established 1908. Trade Names: Benjamin; Saaflux; Coolicon; Benflux; Bencolite; Flurolier. Directors: G. Campbell (Chairman and Joint Managing); H. G. Campbell (Joint Managing); A. E. Iliffe; W. D. Steele; H. L. Smith; L. R. Kavanagh. BENNETT (THOMAS) & SONS (LEEDS) LTD., SOUTH LEEDS GLASS Works, 39 MEADOW LANE, LEEDS 11. T.A., "Benetglas, Leeds 11". T.N., Leeds 31258/9. Lancaster Office: MAIN STREET, SKERTON, LANCASTER. T.N., Lancaster 4713. Established 1903. Stockists of plate, sheet and safety glass. Manufacturers and processers of constructional glass products; stained glass; leaded lights; patent glazing. Managing Director: H. B. Bennett. 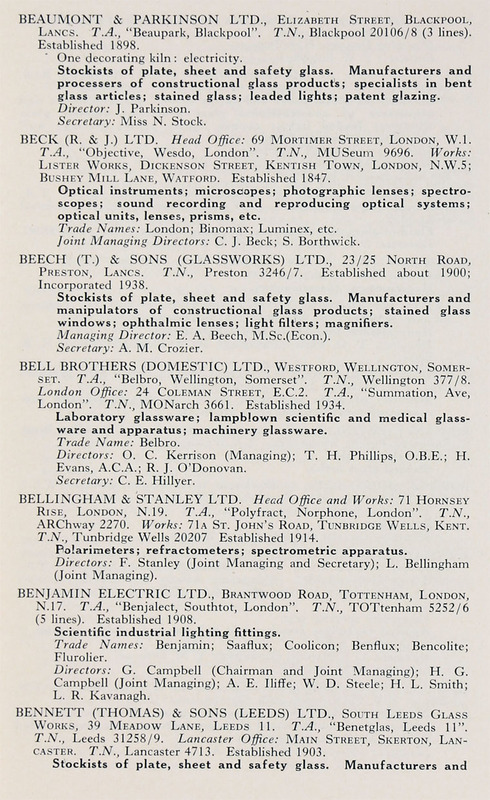 B. J. L. GLASS CO., ST. MATTHEWS HOUSE, 20 ST. MATTHEWS ROW, LONDON, E.2. T.N., BIShopsgate 6198 and 5397. Established 1937. Stockists of plate, sheet and safety glass. Manufacturers and processers of constructional glass products; stained glass windows; leaded lights; copper lights; patent glazing; wall panelling; mirrors; reflectors, etc. BLACK (B.) & SON LTD., 180 GOSWELL ROAD, LONDON, E.C.1. T.A., "Gasthermo, Barb, London". T.N., CLErkenwell 2908. Established about 1850. Fluid-in-glass thermometers, covering ranges from -200/550°C. Directors: A. E. Black (Managing); L. F. Savory. BLACKMAN (W.), 277/ 279 GOSWELL ROAD, LONDON, E.C.1. T.N., TERminus 8984. Established 1949. BLAKE (T. O.) 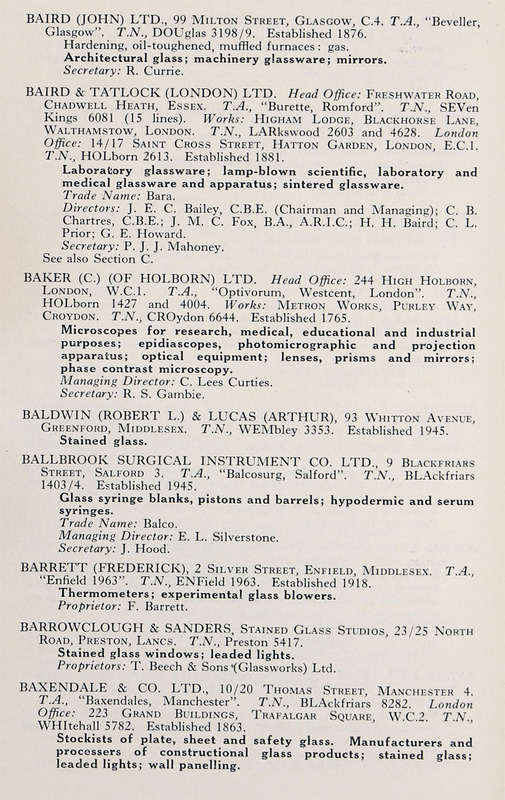 (SIKES HYDROMETERS) LTD., 25 BELLEVUE TERRACE, LONDON, N.W.4. T.N., HENdon 3155. Established 1905. Hydrometers; lamp blown medical glassware. Directors: T. 0. Blake (Managing); K. V. Blake (Secretary); K. E. Blake. BOARDMAN (R. J.) & SON, 34 WINDMILL STREET, HORSE FAIR, BIRMINGHAM. T.N., MIDland 2215. Established 1919. Stockists of plate and sheet glass. Manufacturers and processers of constructional glass products. BOSSANYI (ERVIN), THE STAINED GLASS STUDIO, 22 FIELD END ROAD, EASTCOTE, PINNER, MIDDLESEX. T.N., PINNER 2880. One electric kiln. BOWDEN (JOHN) LTD., 44 ST. GILES HIGH STREET, LONDON, W.C.2. T.N., TEMple Bar 5981. Established 1800. Three glass-bending furnaces: coke. Managing Director and Secretary: J. Bowden. BOWMAN (EDWARD) & SON LTD. Head Office: GAMAGE BUILDINGS, HOLBORN, LONDON, E.C. 1. T.A., "Bowmanist, Smith, London". T.N., HOLborn 6540 and 2541. Temporary Address: STUDIOS, 19 OLDBURY PLACE, MARYLEBONE, LONDON, W.1. T.N., WELbeck 4912. Established 1911. Electrically operated lehr. Applied ceramics; free-hand in painted and crinkle enamels. Directors: C. J. Bowman (Managing); V. M. Bowman. 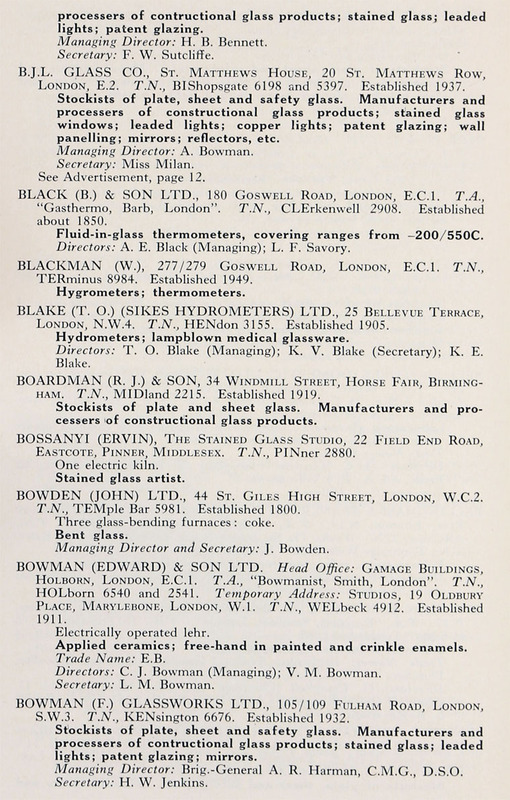 BOWMAN (F.) GLASSWORKS LTD., 105/109 FULHAM ROAD, LONDON, S.W.3. T.N., KENsington 6676. Established 1932. Stockists of plate, sheet and safety glass. Manufacturers and processers of constructional glass products; stained glass; leaded lights; patent glazing; mirrors. Managing Director: Brig.-General A. R. Harman, C.M.G., D.S.O. BRANNAN (S.) & SONS LTD. Head Office: 46 LONDON ROAD, LONDON, S.E.23. T.A., "Ciinitherm, London". T.N., FORest Hill 3414. Works: CLEATOR MOOR, WEST CUMBERLAND. T.A., "Ciinitherm, Cumberland". T.N., Cleator Moor 3414/5. Established 1913. Directors: S. Brannan (Managing); V. N. Brannan (Secretary); E. Brannan; S. C. Brannan; T. M. Brannan. BRICKETT EQUIPMENT LTD., 15 SEETHING LANE, LONDON, E.C.3. T.N., ROYal 2314 and 3770. Established 1946. Fibreglass woven glass fabrics: " Royal Plush" -a fire-resisting plush finish on glass fabric; "Glasstex" Sheen-a fire-resisting decor fabric, coated plastic on one side, reflecting delicate colours through the weave on the reverse; " Giasstex" CBS fire-resisting, coated both sides, forming waterproof article, shower-bath curtains, etc. ; " Arabian Silk"-coloured glass fabrics, fast-to -light, in deep and pastel shades. Managing Director: F. H. J. Press. 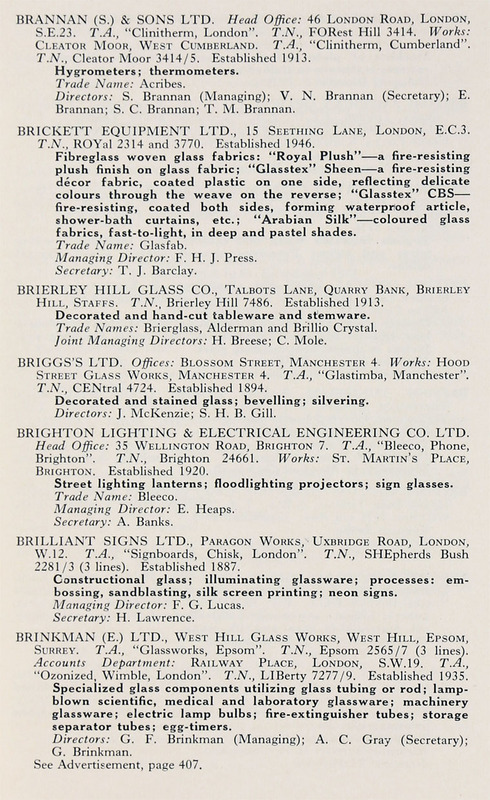 BRIERLEY HILL GLASS CO., TALBOTS LANE, QUARRY BANK, BRIERLEY HILL, STAFFS. T.N., Brierley Hill 7486. Established 1913. Decorated and hand-cut tableware and stemware. Trade Names: Brierglass, Alderman and Brillio Crystal. Joint Managing Directors: H. Breese; C. Mole. BRIGGS'S LTD. Offices: BLOSSOM STREET, MANCHESTER 4. Works: HOOD STREET GLASS WORKS, MANCHESTER 4. T.A., "Glastimba, Manchester" .T .N., CENtral 4724. Established 1894. Decorated and stained glass; bevelling; silvering. Directors: J. McKenzie; S. H. B. Gill. BRIGHTON LIGHTING & ELECTRICAL ENGINEERING CO. LTD. Head Office: 35 WELLINGTON ROAD, BRIGHTON 7. T.A., " Bleeco, Phone, Brighton". T.N., Brighton 24661. Works: ST. MARTIN'S PLACE, BRIGHTON. Established 1920. Street lighting lanterns; floodlighting projectors; sign glasses. BRILLIANT SIGNS LTD., PARAGON WORKS, UXBRIDGE ROAD, LONDON, W.12. T.A., "Signboards, Chisk, London". T.N., SHEpherds Bush 2281/3 (3 lines). Established 1887. Constructional glass; illuminating glassware; processes: embossing, sandblasting, silk screen printing; neon signs. Managing Director: F. G. Lucas. BRINKMAN (E.) LTD., WEST HILL GLASS WORKS, WEST HILL, EPSOM, SURREY. T.A., "Glassworks, Epsom". T.N., Epsom 2565/7 (3 lines). Accounts Department: RAILWAY PLACE, LONDON, S.W.19. T.A., "Ozonized, Wimble, London". T.N., LIBerty 7277/9. Established 1935. Specialized glass components utilizing glass tubing or rod; lamp-blown scientific, medical and laboratory glassware; machinery glassware; electric lamp bulbs; fire-extinguisher tubes; storage separator tubes; egg-timers. Directors: G. F. Brinkman (Managing); A. C. Gray (Secretary); G. Brinkman. BRISTOW, WADLEY & CO. LTD. Head Office and Works: MILL LANE, CARDIFF. T.A., "Glasshouse, Cardiff". T.N., Cardiff 5866/8 (3 lines). Works: 62/4 OXFORD STREET, SWANSEA. Stockists of plate and sheet glass. Bevellers, silverers and cutters; craftsmen in stained glass. Managing Director: C. P. Bristow. BRITISH AMERICAN OPTICAL CO. LTD. Head Office: 39 HATTON GARDEN, LONDON, E.C.1. T.A., "Amoptico, Smith, London". T.N., CHAncery 6941/4 (4 lines). Works: SANDOWN ROAD, WATFORD, HERTS. ; GREEN FIELDS, KIDWELLY, CARMS., SOUTH WALES. Trade Names: Isophane; Watford; Radiex. BRITISH INSULATED CALLENDER'S CABLES LTD. Head Office: NORFOLK HOUSE, NORFOLK STREET, LONDON, W.C.2. T.N., TEMple Bar 7722. London Sales Office: 48 NINE ELMS LANE, S.W.8. T.N. MACauley 5156. Bi-glass insulated wires and cables; glass insulated winding wires and strips; Pren-type aircraft cables; Glasil aircraft cables. 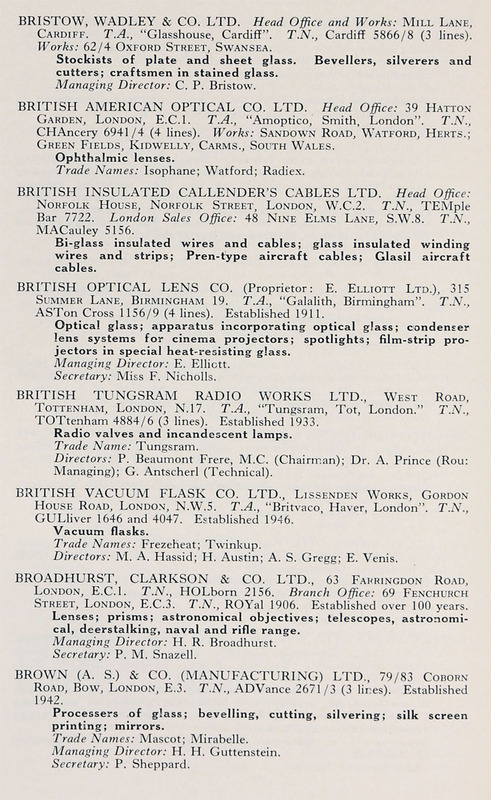 BRITISH OPTICAL LENS CO. (Proprietor: E. ELLIOTT LTD.), 315 SUMMER LANE, BIRMINGHAM 19. T.A., "Galalith, Birmingham". T.N., ASTon Cross 1156/9 (4 lines). Established 1911. Optical glass; apparatus incorporating optical glass; condenser lens systems for cinema projectors; spotlights; film-strip projectors in special heat-resisting glass. BRITISH TUNGSRAM RADIO WORKS LTD., WEST ROAD, TOTTENHAM, LONDON, N.17. T.A., "Tungsram, Tot, London." TOTtenham 4884/6 (3 lines). Established 1933. Radio valves and incandescent lamps. Directors: P. Beaumont Frere, M.C. (Chairman); Dr. A. Prince (Rou: Managing); G. Antscherl (Technical). BRITISH VACUUM FLASK CO. LTD., LISSENDEN WORKS, GORDON HOUSE ROAD, LONDON, N.W.5. T .A., "Britvaco, Haver, London". T. N., GULliver 1646 and 4047. Established 1946. Directors: M. A. Hassid; H. Austin; A. S. Gregg; E. Venis. BROADHURST, CLARKSON & CO. LTD., 63 FAIIRINGDON ROAD, LONDON, E.C.1. T.N., HOLborn 2156. Branch Office: 69 FENCHURCH STREET, LONDON, E.C.3. T.N., ROYal 1906. Established over 100 years. Lenses; prisms; astronomical objectives; telescopes, astronomical, deerstalking, naval and rifle range. Managing Director: H. R. Broadhurst. BROWN (A. S.) & CO. (MANUFACTURING) LTD., 79/83 COBORN ROAD, BOW, LONDON, E.3. T.N., ADVance 2671/3 (3 lines). Established 1942. Processers of glass; bevelling, cutting, silvering; silk screen printing; mirrors. Managing Director: H. H. Guttenstein. BROWN (DOROTHY), THE STUDIO, MIDLAND BANK CHAMBERS, 38 FORE STREET, HERTFORD, HERTS. Established 1948. BUSH (HY. W.) & CO. LTD., WADDON FACTORY ESTATE, CROYDON. T.A., "Bushranger, Souphone, London". T.N., CROydon 1944/5. Established 1887. Lamp blown scientific and medical glassware; male and, female glass syringes; ear and nose syringes; graduated measures. Directors: H. Bush (Managing and Secretary); B. T. Pegg; E. C. Turner. This page was last edited on 11 February 2019, at 08:34.